In response to presentation at Computers in Libraries where a NEW RULE was handed down from on high: "NO MORE THAN 10 WORDS ON A SLIDE"
Clutter Lovers Unite: Don't stress about the mess! I was gratified this morning to read this article in the New York Times by Sara Rimer: An orderly office? That’s personal. The article reports on Lisa Whited, an interior designer who specializes in adapting work spaces to the needs, habits, and goals of their users. 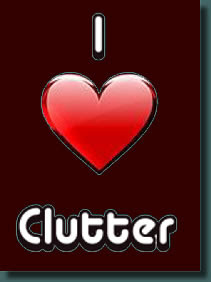 She's not your typical "get rid of the clutter now!" organizer. Instead of boilerplate suggestions for getting organized, Whited begins her jobs by interviewing clients to determine their specific work habits and styles. 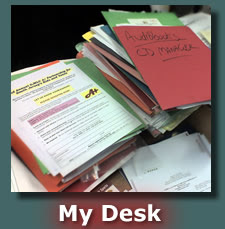 What particularly caught my attention was that after interviewing her client (the author of the article), Whited surmised that she was the kind of person who needed to see things in front of her or else she forgot she had them, so putting things away in a filing cabinet might not be an effective organizational strategy. Reading those words, I wanted to reach into the paper (well, into the laptop--I read the Times online now) and wrap my arms around Whited and thank her for validating my life. 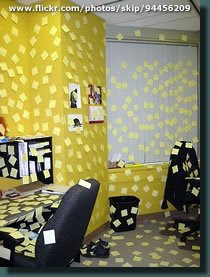 While paper reminders in my field of vision can help, they also have their downside. One piece of paper can be accidentally placed over another piece of paper. Or it can blow away. Or it can have coffee spilled on it. For these reasons, I’ve actually arranged my work life to be as free from paper as possible. There’s probably the equivalent of 20 reams of paper sitting on my desk right now, most of it in colored folders. 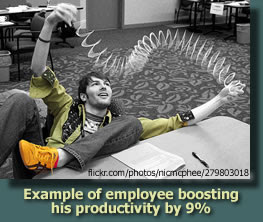 98% of it has been generated by someone else and given to me at a meeting or conference. If it’s something I think I may ever want to reference again, I’ve trained myself to scan it into PDF so I have an electronic copy. One great benefit of putting everything into electronic format is that, thanks to Google Desktop Search, I can find anything I ever "touched" on my computer -- email, website, pdf, etc. -- immediately, and sometimes quicker! While these piles on my desk may look like a mess to the outside observer, I like having them visible because they remind me to look through them now and then and pull out little tidbits. A note jotted in the margin a of a Powerpoint handout from a conference presentation or a handout from a workshop I've given (and completely forgotten about) can trigger new insights and connections, or give me a new perspective on a problem I'm dealing with. I like the serendipity of it. It's both relaxing to me and stimulating.